Part 1: What’s Cool About Review + Approval? Review + Approval, inMotion’s brand new online proofing environment, features a sleek new look and improved functionalities, all designed to help teams collaborate better than ever before. But how do all of those new functionalities work? And what exactly do they mean for current and new users? Our Customer Success team caught up with the inMotioneers responsible for the magic behind Review + Approval to discover the ins and outs of the new environment. We’ll share their answers in this blog post series, all about what’s cool about Review + Approval. Post 1 covers the thinking behind creating Review + Approval, and the basics of how it works. What motivated the creation of Review + Approval? Over the past 10 to 15 years, we’ve seen teams change quite a bit. People were once more siloed in their roles—now they’re more collaborative. Today, people want to be able to not only do reviews, but collaborate on reviews, so we needed our technology to reflect that. We wanted to take everything we’ve learned over the past years and apply it to our application, so that everything it does is intelligent and for a purpose. There’s an intention on the team’s part to broadly revamp the existing tools and make them more collaborative. How did you decide on the design? 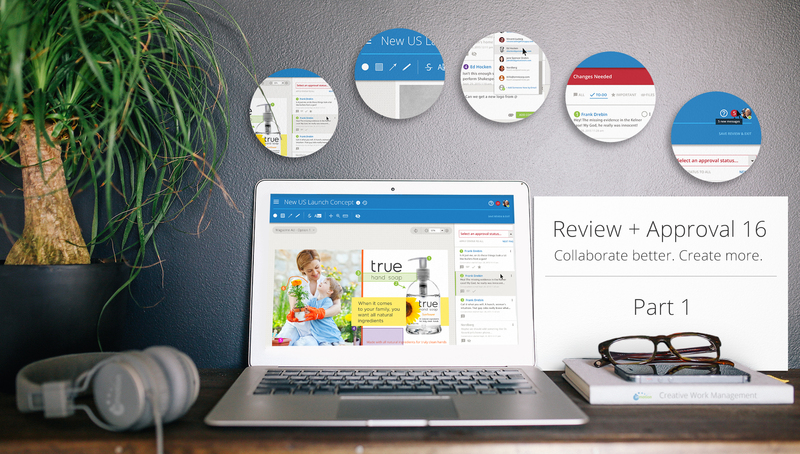 The new review environment is about showing users something that’s familiar so that it’s easy and intuitive to work. We piggybacked off Google when it comes to design research and usability. We’ve taken design conventions that exist across the web, on phones, and so forth, and you can see those conventions in Review + Approval now. What were the main goals of the project? There were multiple goals! We definitely wanted to add new features in the environment that would focus on collaboration, since the old system was more focused on single reviewer approvals as opposed to reviewing as a group. We also wanted to migrate away from Adobe Flash® as a platform that we’re working on. Flash and Firefox have been around for a long period of time and are losing support. Beyond that, we really were just aiming for a more updated look and feel! What are other benefits of switching from Flash to HTML5? Another big one is that there’s now text search and spell check capabilities. If the proof asset has fonts embedded, you can hit “Control+F” to search the entire page for whatever words you want. And if you’ve misspelled a word while commenting, the browser’s built-in spell checker will underline it and let you know. In terms of file upload and review, one of the benefits of moving away from Flash is that we removed the restrictions from how we had to manipulate files to export them. We can better support files we had trouble with in the past, like PDFs and other text documents, because you can upload them native to the browser. We also work better with images and can support file types that our competitors don’t support, but that are really important to creatives, like Adobe Illustrator files. Does Review + Approval work on all browsers? It works on Chrome, Firefox, Safari, Internet Explorer, and Edge, and we’ve done a ton to optimize it for each of them. Is Review + Approval more customizable? How so? It is. Users definitely have a greater ability to manage the review environment. In the past, we had the ability to turn different features on and off, but it had to be done by a developer. The goal moving forward is to allow inMotion clients to manage most of those features themselves, so they can control the review environment for their team—remove certain controls, apply certain permissions, and make things easier for users in their system. Another fun change is colors. The current review application only allows 3. In Review + Approval, users can change colors at an individual level, so users can identify what color they want to use and all comments and mark-ups specific to that individual will be that color. That means users can be assigned colors based on role, level at the company, and so forth. Are there parts of Review + Approval that will continue to change? We will expand the set of options available outside the current core system of necessary features as we introduce more. The Review and Approval application has a lot of capabilities inside of it, but they won’t be enabled out of the gate as we introduce people into it. The necessary features are the ones that are most important, but we have a really powerful platform that we can expand upon. There will still be additions and this will be an ongoing project that constantly expands. To learn more about the functionalities in our new online proofing environment, stay tuned for the next post in our series!